In these days of electronic wizardry, a large portion of our lives is conducted and saved on computers. From photographs and videos to work and school projects, we would be lost without our computers. Along with our dependence on technology we should have a healthy respect for the fact that it is not infallible. Hard drives die, servers crash and things are lost. We may not be able to outsmart technology, but we can take the time to do what we can to save our electronic lives. Backing up your genealogy research is an important part of conducting family history these days. Just as our predecessors took special care of personal papers, newsprint and print photographs, we must do the same with our digital files, photographs and videos. I am by no means an IT person, but I can share with you how this laywoman backs up her genealogy research. First off, it may sound strange but I actually use Ancestry.com to store my family tree. I like the format of the site and their servers are way more reliable than anything I may have. I download a GEDCOM file from the site every few weeks so I have copy on my computer, but I only use that to print any reports I may need. I maintain one folder on my computer for all of my family history files and one folder for all of my photos. Within these folders I created subfolders for every family line or photographed event. Creating the subfolders makes it easy to track down a particular document or photograph. It also makes it very easy to back the files up. I have two external hard drives, which can be purchased at reasonable prices just about anywhere, that I save the files to every few weeks. Because my files are only in two folders it is easy to copy them to the hard drive, rather than hunting all over the computer for files I need to save. I have one external hard drive always connected to my computer so I can save or retrieve files whenever necessary. The other hard drive is kept in my fire-proof safe. I rotate the hard drives once every two months. I do this in case some sort of freak electrical incident kills my computer and the hard drive connected to it, I will still have all my research saved on the hard drive in the safe. If you have family near you, or own a safe deposit box, you might contemplate storing a hard drive of your files there in the event that some sort of disaster strikes your home. While much of our genealogy research can be conducted online, it is still a very paper-heavy hobby. I have many paper documents that I am currently working to digitize. When I receive a document I immediately scan it in to my computer. I'm a pack rat, so I still keep the paper version, but if something should happen I now have it digitized. 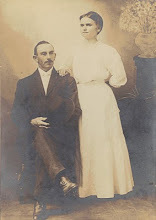 I am also working to digitize all of my family's photos. I borrowed my grandmother's photos and have been scanning all of them in to my computer. I also back these files up on my hard drives. When I am finished I plan to burn cds of all of the photos and give copies to my relatives. This allows all of us to have a copy of the old photos and also makes it easy to have prints created at the local drugstore or box department store. I do not have any fancy equipment, just an external hard drive and an all-in-one printer/fax/scanner that I purchased from Dell. You can find all of these items at places like Walmart, Target, Best Buy, or your favorite office store. Or you can order them online. Another option is to utilize a fee-based data back-up website such at Mozy or Carbonite. These sites offer data backup for around $60 a year and provide not only a storage site for your files, but also offer encryption and access to your files from any computer with an Internet connection. Keep in mind that with these subscriptions you are solely responsible for your backed-up data and may not hold the companies liable should something happen to your files. It may seem cumbersome to save your research, but if you make it part of your routine it is not a big deal at all. It is much easier than starting from square one should the evil technology gremlins steal your files.